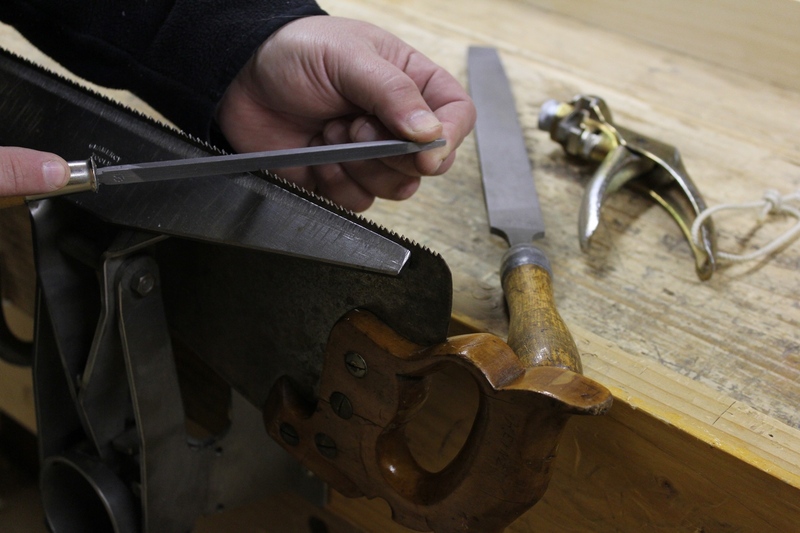 OK, I’m going to finish up my discussion of hand saws today with one more article on choosing hand saws (I’ll cover sharpening them some other time). I already covered my general recommendations for a nest of saws for today’s traditional woodworker in my last article. Today I want to talk more specifically in terms of getting saws that will work best for you. In order to have the most success using hand saws, the most important requirement is that they must be sharp (and sharpened properly). Dull saws probably account for 98% of the frustration that many new hand tool enthusiasts experience with hand sawing. If you buy a new hand saw from a reputable maker like Lie Nielsen, Bad Axe, Grammercy Tools, or Veritas (there are other as well), you can rest assured that the saw will be properly sharpened when you buy it (I cannot say the same for the inexpensive saws carried by many of the woodworking tool retailers). If you are just starting out using hand saws, you have a lot of things to think about. Sending a saw or two to a professional before learning to sharpen them yourself will give you a much better understanding of what a sharp hand saw looks and feels like. But make sure that whoever you send your saws to specializes in sharpening hand saws, or you may be disappointed in the results. If you are planning to purchase antique saws and have them reconditioned for use, make sure that you have a good plan for doing so. I encourage you to sharpen your saws yourself, but if you are brand new to the craft, it helps to know what a properly sharpened saw looks and feels like before you begin. Professional hand saw services are not inexpensive because it takes a fair amount of work to bring most of these old saws back to life. However, if you want a hand saw sharpened right, it is best to seek out someone who specializes in sharpening hand saws until you learn to do it yourself, even though doing so may cost you more than your local sharpening service. Your local hardware store or sharpening service may offer to sharpen your hand saws, but chances are the results will be less than satisfactory. I cannot count the number of customers I have had who have told me that they had used a local service to try and save some money and the cost of shipping, only to get the saw back and send it to me anyway because the local service really didn’t do much to improve the performance of the saw. So they ended up spending more in the end instead of saving money like they thought they would. Most of these local services are used to sharpening things like circular saw blades, router bits and scissors. Very few of them really know how to sharpen a hand saw, and I’d be willing to bet that even fewer are hand filing and actually testing the saw out before they return it to the customer. To get this kind of specialized service requires someone who not only knows how to file a hand saw properly, but also uses hand saws regularly and understands what is being asked of the saw. Of course my little rant here is a bit self serving since I do run a small hand saw sharpening business. But my motives with this rant are far from personal. My goal is for you to have the most satisfaction and least amount of frustration using your hand saws. I don’t care if you send your saws to me, Matt Cianci, Mark Harrell, Joe Federici, Darryl Weir, or another hand saw doctor. But until you can learn to do it yourself, I do encourage you to use the services of someone who specializes in hand saws because they will do the best job, hands down. A properly sized saw handle should allow for a comfortable three finger grip, but should be too small to fit four fingers. After sharpness, having a saw, and sawing appliances, properly sized for your frame is the next most important need. For joinery saws, which are typically used at the bench with a bench hook or with the stock secured in the bench vise, you really need only worry about the size of the handle. You want a saw with a handle that fits your paw like the perfect pair of leather gloves. If the handle is too tight for a proper three finger grip, using the saw will be uncomfortable. If the handle is too large, your hand will move around too much and you won’t grip the saw consistently every time you pick it up. The only way to know if a handle is right for you is to try the saw. This makes buying old saws on the internet a tough thing to do because you cannot physically hold the saw. So you may have to buy several saws before you find one that is the perfect fit for you. However, some companies, such as Bad Axe, will custom size your handle so that it is the perfect size for you whether you have little baby hands or giant Sasquatch paws. With long hand saws, in addition to making sure the handle fits you well, you need to ensure that the length of the saw is appropriate for you as well. But before I talk about how to pick the right length of saw for you, I want to take a second and talk about short saws. 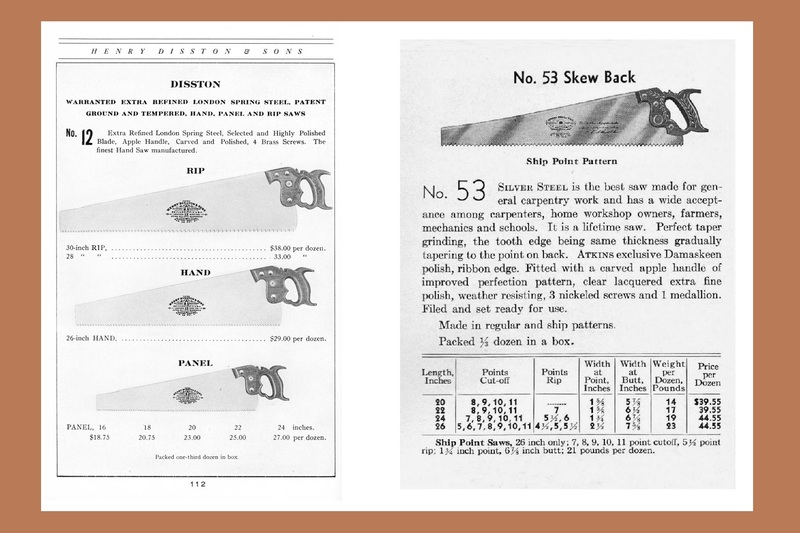 While historical tool catalogs would call anything 24″ and shorter a panel saw, I’m going to narrow that down a bit and say that a short saw is anything 20″ and shorter. I’m going to recommend that you stay away from these short saws if you don’t already own proper full sized saws (22″ and up depending upon your frame). The reason for this recommendation is that I feel that the short saws tend to encourage short strokes. In order to not draw the saw completely out of the kerf when sawing at a knee high saw bench, short saws require you to not use the full range of motion of your arm and shoulder. However, with a properly sized long saw and saw bench, you can use the full length of your saw stroke and not pull the saw from the kerf or drive it into the floor. Sawing with a long saw and full range of motion is much more efficient than using a short stroke saw, so I’m going to recommend that you stick with full length saws. 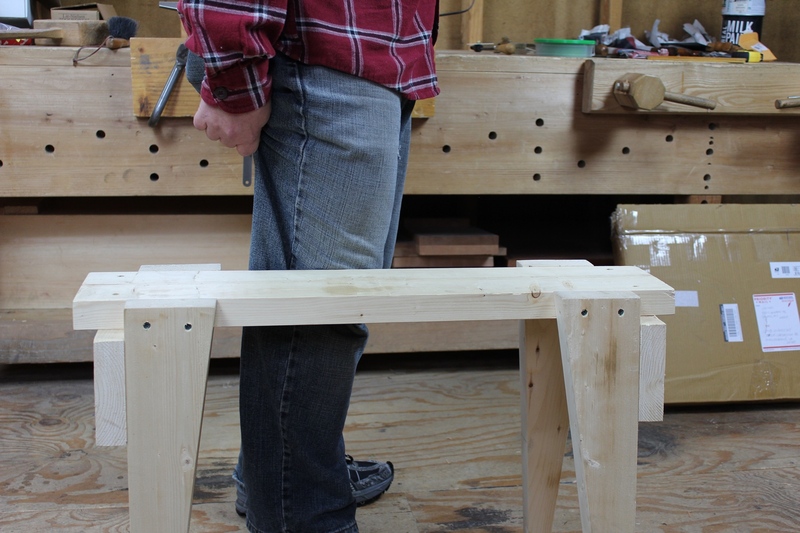 A saw bench should be about the height of the top of your knee cap. With that said, how do you know what a full length saw is for you? Someone 6’2″ tall should not be using the same sized hand saws as someone who is 5’6″ like myself. There are several things to consider when choosing a full length saw. The first is the length of your legs. The saw bench that you are going to use with your long saws should be about the height of your knee cap, or just above, in order to position your body for holding the stock with your knee and sawing without discomfort. If your bench is too high, it will force your knee too high and cause pain in your hip. If the bench is too low, you will have to bend over too far, causing back pain, and you may hit the floor with your saw. So shoot for a saw bench that is about the height of the top of your knee cap. The next thing to consider is the length of your saw stroke. Your saw stroke is the distance that your hand travels from a point where your arm is fully extended to a point where it is fully drawn to the side of your chest. This is the distance that your saw is going to travel. Your saw blade needs to be a little longer than this length. If the blade is shorter than this distance, you’ll pull the blade out of the cut on the back stroke, which is not good. If the blade is a lot longer than this distance, you won’t be cutting with the full length of the blade and you take the chance of hitting the floor with the toe of the saw on the forward stroke, which is also not good. Using a tape measure, run through the motions of sawing a few times, noting the measurement each time. This is your saw stroke length. Add about 2″ for proper saw length. So the goal is to size your saw just an inch or two longer than the length of your saw stroke. The best method of fitting a long hand saw to your frame is to try a bunch of hand saws in different lengths and different styles. However, this isn’t always possible, so there are a couple methods that will get you in the ball park. The first is to position yourself at your saw bench like you were going to saw a board, but holding a tape measure in your non sawing hand. 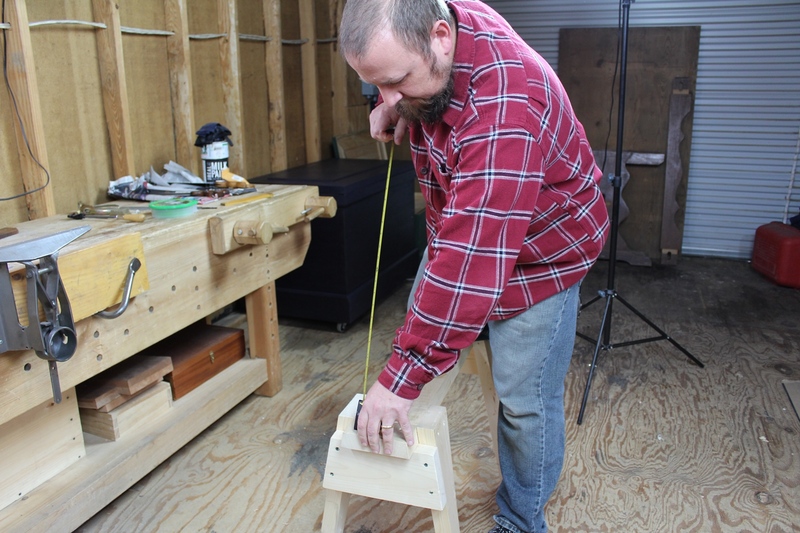 Place the tape measure on the bench top, grab the hook with your sawing hand, and pull back a few times to where your hand will be when sawing. Note the measurement on the tape each time you pull back and figure a general average. This will give you the length of your saw stroke. Add an inch or two to this measurement and you should have a general idea of how long of a saw you should be looking at. 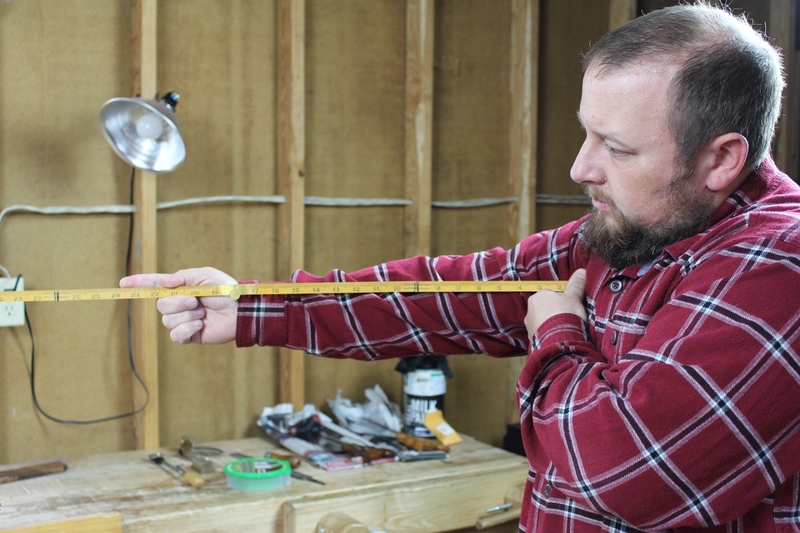 By measuring the distance from your shoulder to your closed fist, and adding about 2″, you can determine a good estimate for your ideal saw length. But if you don’t yet have any saws, you probably don’t yet have a saw bench either. So another way to get close is to measure your arm from the shoulder to your clenched fist. Extend your arm out in front of you and place a ruler or tape measure firmly, but not uncomfortably into your shoulder. Then take the measurement at the furthest knuckle of your clenched fist. This will give you a good estimate of the length of your saw stroke. Again, add an inch or two to this measurement and you should have a general idea of how long of a saw you should be looking for. The blade on some saws is let further into the handle, such as on the Atkins No. 53. This slightly shortens the effective cutting length of the saw. The challenge here is that you cannot just consider blade length because the blade can be let into the handle different amounts depending upon the manufacturer and model of the saw. If the blade is not let far back into the handle, like my saws, and saws like the Disston No. 7 or No. 12, then you can go by the length of the blade alone. However, with saws that have the blade let further into the handle, like the Disston D8 or the Atkins No. 53, you may have to add an extra inch or two. This is because the additional length of blade that is let into the handle shortens the effective cutting length of the blade (the handle hits the work before the rear teeth enter the cut). So consider the type of saw you are looking at and not just the blade length. Using the two measurement methods above, the proper length of saw for me is about 24″ in length with a saw like mine (i.e. blade less let in to the handle). I have found through my years of sawing that this length is right on for me. I can saw, using the entire length of the blade, but not have to worry about accidentally pulling the blade out of the cut or hitting the floor with the saw. Before I made the two saws that I am using now, my old 26″ Disston #7 crosscut and my old 28″ Atkins #53 rip saws would hit the floor from time to time, and I would consistently pull my old 20″ Wenzloff panel saw out of the kerf. These days, I can keep my focus on sawing to the line and not worry about my saw. Try these tips for sizing a saw to your frame and I’m confident you’ll find the perfect saw for you too. And if you want a bit of a chuckle, here’s an old video I did on the topic back in 2012. You’ll note that in this video, I was still using my old 20″ panel saw for crosscutting. I’ve long since sold that saw and switched to using a full sized (24″) saw for crosscutting as well. Posted in Hand Saws, Tools and tagged saw length, saw sharpening, videos. 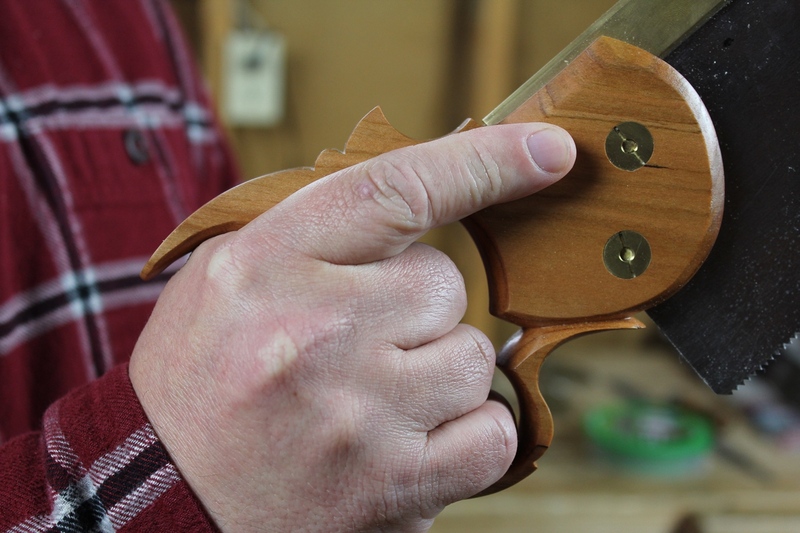 ← What Hand Saws Do You Need?